CS Anne Waiguru beats incumbent Joseph Ndathi as Kirinyaga poll official grilled at Kerugoya. - Bana Kenya News, Real African Network Tubanane. Home featured Nairobi CS Anne Waiguru beats incumbent Joseph Ndathi as Kirinyaga poll official grilled at Kerugoya. CS Anne Waiguru beats incumbent Joseph Ndathi as Kirinyaga poll official grilled at Kerugoya. The Kirinyaga gubernatorial race has an intense heat in the ground following grilling of some party elections officials at Kerugoya. The incumbent governor Joseph Ndathi claimed that Ann Waiguru had a backup from the Jubilee officials directed by the state. The former CS rubbished the claims and urged her supporters to practise clean, secured and peacefully polls. A jubilee party returning officer was on Monday grilled by officers over rigging claims in Mwea, Kirinyaga county. According to residents, the officer was apprehended and handed to the police after he was allegedly found with extra ballot papers in his house. Voters in Kirinyaga also demanded that primaries be halted as many aspirants' names are missing. 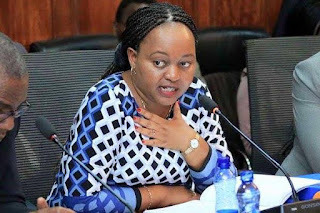 Former Devolution CS Anne Waiguru asked the Jubilee Party to fly more ballot papers to the county before it was too late. The signs from the polls show that the cs Waiguru won the elections as she had an early lead in various polling stations. "They need to come quickly. We don't care whether ballot papers are black and white or coloured. Jubilee Party should take the nominations seriously as we have told them following the hitches. People need to vote. They are losing patience and have become agitated," Waiguru told journalists over rigging claims on Monday. "We need to vote early so that the winners are announced at daylight. If it is Ms Waiguru we must know it during the day. The incumbent governor is sabotaging the process and we will not allow such things to happen." She added. "While the party was prepared for a normal party primary, we were confronted by a full-scale general election in terms of the massive turnout," President Uhuru said. The president also let his deputy oversee the whole exercise in order to avoid the earlier happenings. The president also urged the state machinery to help them in case of any rigging and misappropriations.